Tucked away in the forest of Mar del Plata and nestled in the abundant greenery sits a hidden and unusual place. From the outside it appears to be an attractive private home, but walk up the winding stone stairs and through the heavy wood door and you are instantly greeted by a spread of cakes and goodies fit for Argentina’s finest. A truly cozy hideaway, La Cabana del Bosque, is a unique outing and the perfect spot for a bit of afternoon tea. Since Mar del Plata is the beach destination for most of Argentina, known for its surf and sun, the idea of spending an afternoon tucked in a cozy cabin sipping tea may seem a little incongruous. But driving or walking through the woods of Mar del Plata is a peaceful and cooler alternative to the throngs of sweaty masses that flood the beaches everyday. A wealthy microcosm of Mar del Plata, the woods are sparsely populated and soothingly green. A small park with a playground sees families gather for mate and amusement, while a local artisan fair is held on weekend evenings attracting tourists and locals alike. La Cabaña is located in the Bosque Peralta Ramos at the southern end of the city. Since the bus system in Mar del Plata is far from user friendly, you have to buy a card in advance and keep charging it up, you might have to take a taxi or find a friend with a car. But if you are spending the day at one of the many beaches south of the city, such as La Arena where many of the big summer concerts are held, then you are in the neighborhood and can easily pass through on our way back into the city. 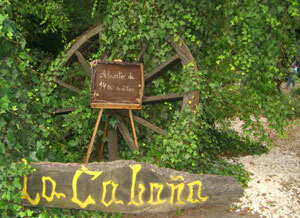 Look for a parking lot and a wooden sign with Las Cabañas carved into it resting in the ivy next to a large wagon wheel. There are very few restaurants in the Bosque so if you ask a local they will be able to point you in the right direction. Aside from a selection of over a dozen tantalizing cakes served up with whip cream or dulce de leche, there are home made scones and fresh baked savory breads. They also serve a wide selection of loose-leaf teas, from lavender to citrus to green, and each arrives in it’s own special teapot. With each person ordering their own tea, and each tea arriving in its own individual and decorative teapot, the restaurant begins to look a little like the Mad Hatters tea party from Alice in Wonderland. The teas complement a thorough selection of coffees and hot chocolates so there is something for everyone in your party. Thanks to the location, the style and the amazing ambiance, the prices at this distinctive retreat are far from cheap; a pot of tea costs 5-8 pesos and a slice of cake is 9. But you can sit and sip your tea for hours, soaking up the atmosphere and pretending you are in a log cabin in the Swiss Alps. The décor is truly distinguished, it feels as though the owners unlocked the attics of hundreds of Argentines and brought out all the antiques, random paintings and decorations they discovered hidden away. The walls are covered, all the way to the ceiling, with various styles of painting and textiles, statues and knick-knacks adorn the windowsills and shelves, and the bathroom is a world unto itself. The interior is cozy and kitsch and the surrounding woods are open for exploration, complete with a coy pond, towering eucalyptus trees, and tree trunk picnic tables hidden amidst the bamboo. Afternoon tea is far from typical in Argentine culture, and an afternoon in a cabin in the woods may not be what you are expecting on your beach weekend trip to Mar del Plata, but don’t let that stop you. 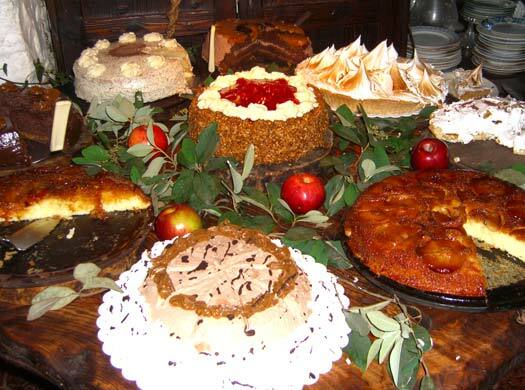 Take a walk through Mar del Plata’s woodland oasis and enjoy a scrumptious afternoon treat. This page rendered in 0.088 seconds.